Basics of the hCG Diet ProtocolVIP's: Very Important PostsHow Much Weight Will You Lose with hCG?Does This Diet Work?Is the hCG Diet Healthy? There's basically 5 main steps to doing 1 round of hCG. This diet is done in "rounds" or "cycles" where you lose a chunk of weight, take a break, then go back to lose another chunk by following the 5 main steps all over again. What Type of hCG Should You Buy? This is the stuff you absolutely NEED to know before (or at least during!) your round of hCG - the sort of stuff that can make or break your round. How Much Weight Will You Lose with hCG? Ah, one of the hottest topics! I plan to have more on this question in the near future. How Fast Can You Get to a Normal Weight with hCG? You can check out my personal results below. As of November 2014, I have been maintaining my weight loss from the hCG protocol for 2 full years and haven't used hCG at during that time. Is the hCG Diet Healthy? 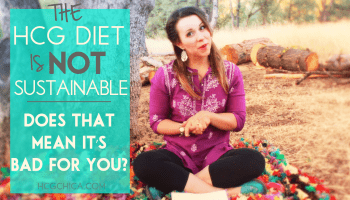 If you're really new to this diet and just learning about, you will likely have read in numerous places that it's a starvation diet, that you'll lose a lot of muscle, and gain all the weight back. IF this is true, you should certainly know about it right? These articles below discuss some of these assertions and whether they are truly a concern or not with logical information based on real experiences. The hCG Diet is Unsustainable - Does That Make It Unhealthy?